You wanna play comp Firenze? nah when I said the weekend I meant tomorrow and sunday, busy today, won't get play so decay will start smh. how much do you lose with that? smh might try to get one in, if I lose I'll probably fall just under Diamond though. Also ordered a new headset today, don't mind playing with randoms if I can communicate. we held second point Hanamura entirely, I message a guy to focus down the Sym and Mercy in the second round as he's Tracer he says OK then gets disconnected at the start and comes back for the last 30 seconds and we draw. randoms on this game are dogshit. Still not worth playing unless you have a pre-made of like 3 ppl. well, it was genuinley my intention to smash this over the weekend but the insane heat just made it impossible, ain't nobody got time to play games in 30 degree heat, tried playing OW a bit a few times but quit after 1-2 matches because I couldn't concentrate. Got my new mic at least doe, when the weather improves I'll be playing it heavy. 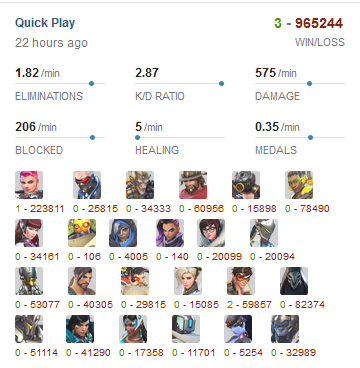 you any good with Sombra? was watching a video that was talking about her being GOAT on 2CP. Seen a lot of her used in pro matches too. Might start using her in QP. Yeah that's why I practiced her alot during off season beacuse of 2CP def. Before her I played Torb & Mei on def.